PanARMENIAN.Net - Indonesia is striving to improve its access to the European market via three different arrangements with economic unions on the continent, The Phnom Penh Post reports. The latest development came last week when Minister of Trade Enggartiasto Lukita signed a joint ministerial statement on trade with Tatyana Valovaya, the integration and macroeconomics minister of the Eurasian Economic Union (EAEU). In the ministerial statement, the two ministers expressed a commitment to sign a memorandum of cooperation (MoC) within the first half of this year to strengthen the bilateral relationship, Enggartiasto said. “We plan to sign the MoC during one of the business forums we will hold this year . . . either in Vladivostok or St Petersburg [both in Russia] or at the upcoming Trade Expo Indonesia,” he said at the ministry’s office in Jakarta recently. 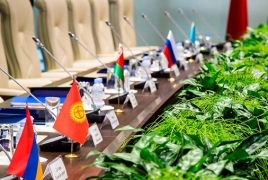 The members of EAEU are Russia, Kazakhstan, Belarus, Armenia and Kyrgyzstan. Trade between the EAEU and Indonesia totalled $2.79 billion in 2017. Through the MoC, Enggartiasto said the figure could double over the next five years. The Ministry of Trade said in a statement in January last year that discussions with the EAEU were projected to result in a comprehensive economic partnership agreement (CEPA). However, Enggartiasto said it would be difficult to reach a more detailed agreement as the deal would involve a union of five countries, hinting that any negotiations on a prospective CEPA would take a long time. Valovaya lauded the joint-ministerial statement, saying the door remained open for the two sides to turn the upcoming MoC into a free trade agreement after both parties held more in-depth talks. The members of EEU are Armenia, Russia, Kazakhstan, Belarus and Kyrgyzstan. Trade between the EEU and Indonesia totalled $2.79 billion in 2017.